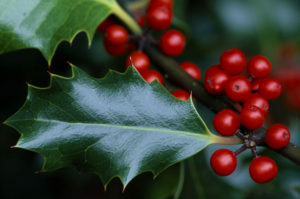 Now is the of year homes are being decorated for Christmas and one of the best loved natural decorations is holly. This article, written by Alan Watson Featherstone, founder of the award winning conservation charity Trees for Life gives a fascinating insight into these trees. 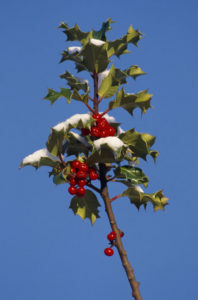 Holly is an evergreen, broadleaved tree in the Aquifoliaceae family, which consists of the single genus, Ilex, with over 400 species worldwide. It can grow to be as be as tall as 25 metres. Its trunk can be up to 40-80 cm. in diameter, but it frequently divides near the ground, giving rise to multiple smaller stems growing close together. The lower branches from these are often tangled amongst each other, and, where they touch the ground will take root, making the central part of the tree relatively inaccessible. The bark of holly is grey and smooth, becoming somewhat fissured with age. The leaves are from 5-12 cm long and 2-6 cm wide, and deep green in colour above, but paler underneath. The leaves are leathery and shiny, and, on the lower part of the tree, have three to seven sharply pointed spines on each margin, that alternate in pointing upwards and downwards. Higher up, where they are out of reach of grazing herbivores, the leaves tend to have fewer or no spines. Individual leaves persist on a tree for 2 – 3 years, and when they are shed (usually in the spring) they take a long time to decay, so that skeleton leaves can often be seen on the ground. There are also comparatively few phytophagous (plant-eating) insects that feed on holly, with less than a dozen recorded in the UK. Of these, the holly leaf miner (Phytomyza ilicis) is the most common, and the larvae of this fly produce distinctive trails, or mines, in the leaves. The larvae of the micro-moth, holly tortrix (Rhopobota naevana), specialise in feeding on the tender young shoots of holly, while the larvae of two other moth species, the double-striped pug (Gymnoscelis rufifasciata) and the yellow-barred brindle (Acasis viretata), feed on the flowers of holly, as well as on other plants. Caterpillars of the holly blue butterfly (Celastrina argiolus) also feed on the flowers and buds. However, this species is mainly confined to the southern half of the UK, where its numbers exhibit dramatic fluctuations every few years, due, it is thought, to the impact of a wasp (Listrodomus nycthemerus) that parasitises the butterfly’s larvae. With thanks to Trees for Life for allowing us to publish this article. Trees for Life is the only organisation specifically dedicated to restoring the Caledonian Forest to a target area of 600 sq miles in the Scottish Highlands. They work in partnership with the Forestry Commission, RSPB and private landowners, and own and manage the 10,000 acre Dundreggan Estate.